Carl Gustav Carus (1789–1869), View of Dresden at Sunset (c 1822), oil on canvas, 22 x 30.5 cm, Kunstsammlungen Chemnitz, Chemnitz, Germany. Wikimedia Commons. I hadn’t realised that Caspar David Friedrich had at least one pupil, and a rather unusual one at that: Carl Gustav Carus (1789–1869), who when he was learning to paint was already a professor of obstetrics in Dresden, Germany. This and the next article look at the remarkable polymath Carus and his paintings. Carus was a Renaissance man: an eminent obstetrician and gynaecologist who ran obstetric services in the city of Dresden, a botanist and zoologist who influenced Darwin, a physiologist and pioneer psychologist who helped develop the concept of the unconscious, a friend and influence of Johann Wolfgang von Goethe, and, as we shall see, a highly accomplished painter of Romantic ‘Gothic’ landscapes. Carus first trained as a medical practitioner, but during those years also seems to have taken drawing classes. 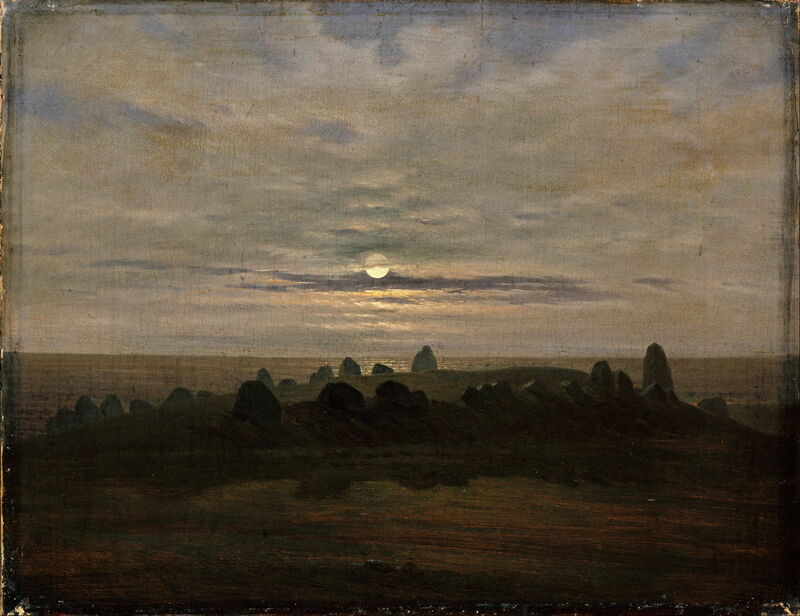 When he was appointed professor of obstetrics in Dresden in 1814, he started to concentrate on painting in oils, which he learned under Caspar David Friedrich, who had moved to Dresden in 1798. The two became good friends. 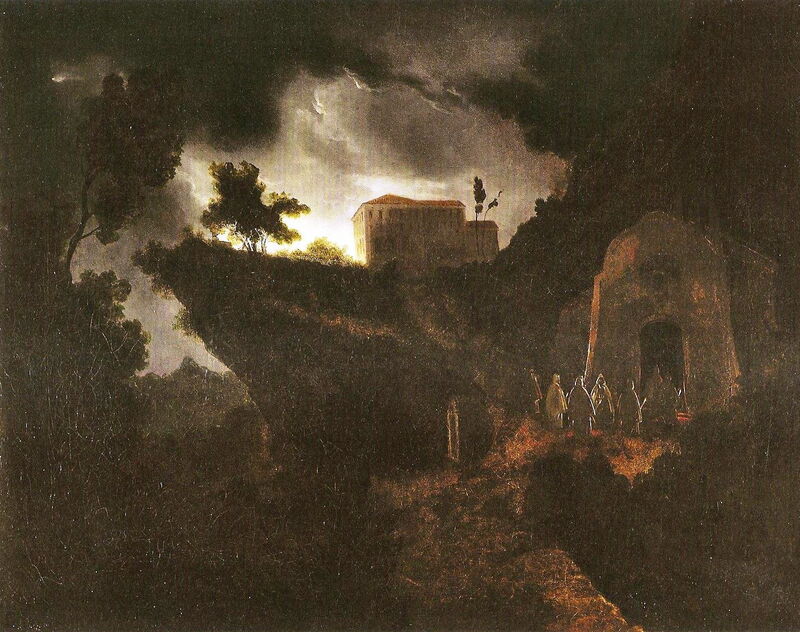 Carl Gustav Carus (1789–1869), Return of the Monks to the Monastery (c 1816-18), oil on cardboard mounted on canvas, 50 x 63 cm, Museum Folkwang, Essen, Germany. Wikimedia Commons. One of Carus’ earliest surviving works is this sketch on cardboard of the Return of the Monks to the Monastery from about 1816-18, the end of his period studying with Friedrich, and just prior to Friedrich’s marriage. Outlined by an ethereal light, a group of monks are entering the large doorway of a chapel at the right. On the hill in the centre, lit from behind by the moon, stands their isolated monastery. Carl Gustav Carus (1789–1869), Wanderer on the Mountaintop, Pilgrim’s Rest (1818), oil on canvas, 43.2 x 33.7 cm, Saint Louis Art Museum, St. Louis, MO. Wikimedia Commons. 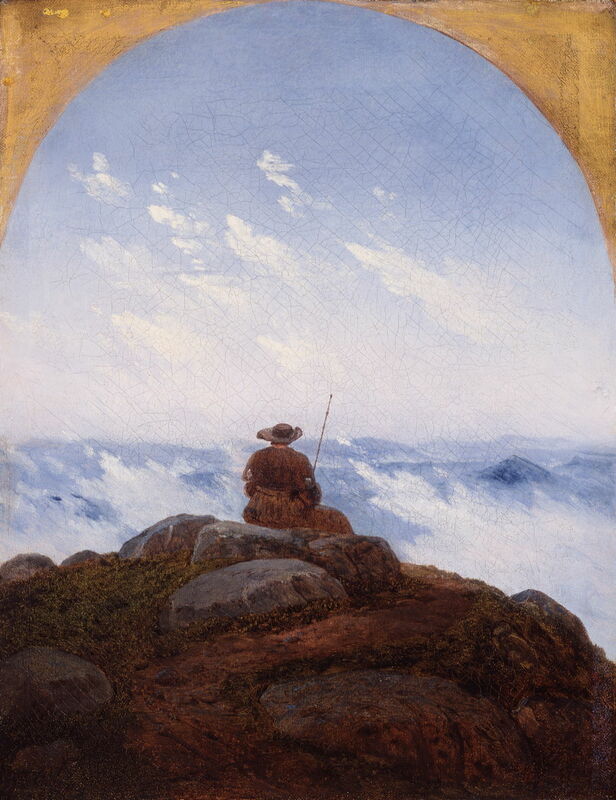 Carus’ Wanderer on the Mountaintop, Pilgrim’s Rest from 1818 is closely related to Friedrich’s Wanderer above the Sea of Mists which was painted in the same year. However, I don’t know who inspired whom. At this stage of his scientific career, Carus’ professional achievements were mainly in the field of zoology and anatomy, and in 1820 he published his first textbook on gynaecology. 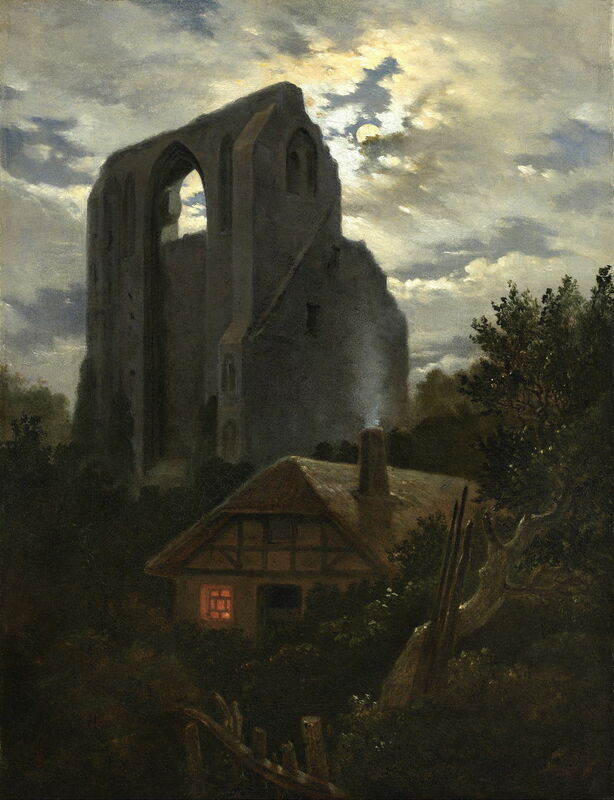 Carl Gustav Carus (1789–1869), Ruins of the Eldena Monastery with a Cottage near Greifswald in Moonlight (1819-20), oil on canvas, 43 x 33 cm, Pommersches Landesmuseum, Greifswald, Germany. Wikimedia Commons. Ruins of the Eldena Monastery with a Cottage near Greifswald in Moonlight from 1819-20 shows another of Friedrich’s favourite motifs, the imposing remains of the former Cistercian monastery near Greifswald in Pomerania, to the south of Germany’s Baltic coast. Founded in 1193, the abbey was dissolved in 1535, and fell derelict from 1650 onwards. 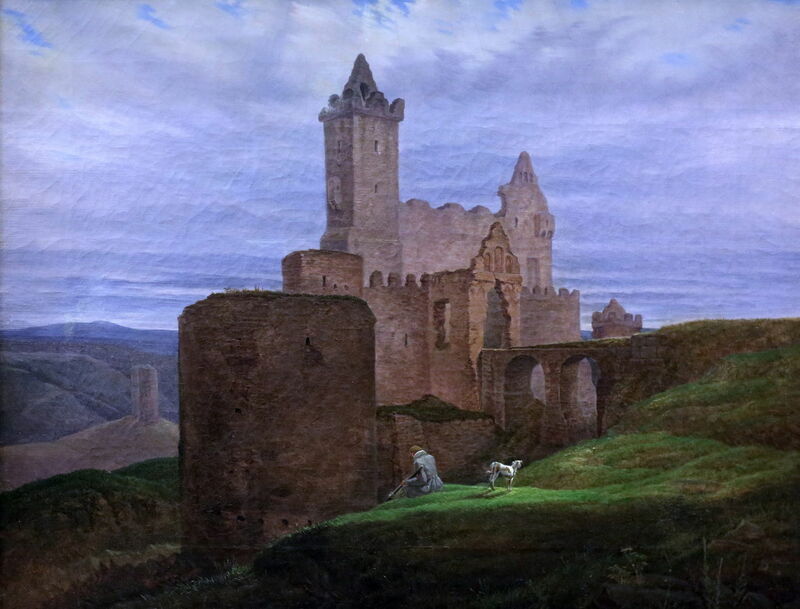 Friedrich painted it from about 1809 onwards, in The Abbey in the Oakwood. Carl Gustav Carus (1789–1869), Stone Age Stronghold at Nobbin, Rugen Island (c 1820), oil on canvas, 33.5 x 43 cm, Nasjonalgalleriet, Oslo, Norway. Wikimedia Commons. Stone Age Stronghold at Nobbin, Rügen Island (c 1820) shows a neolithic site on this island in the southern Baltic, whose famous white cliffs feature in Friedrich’s well-known honeymoon painting Chalk Cliffs on Rügen (1818). Carus again uses the muted and faintly sinister light of the moon to enhance the drama of this ancient stone circle. 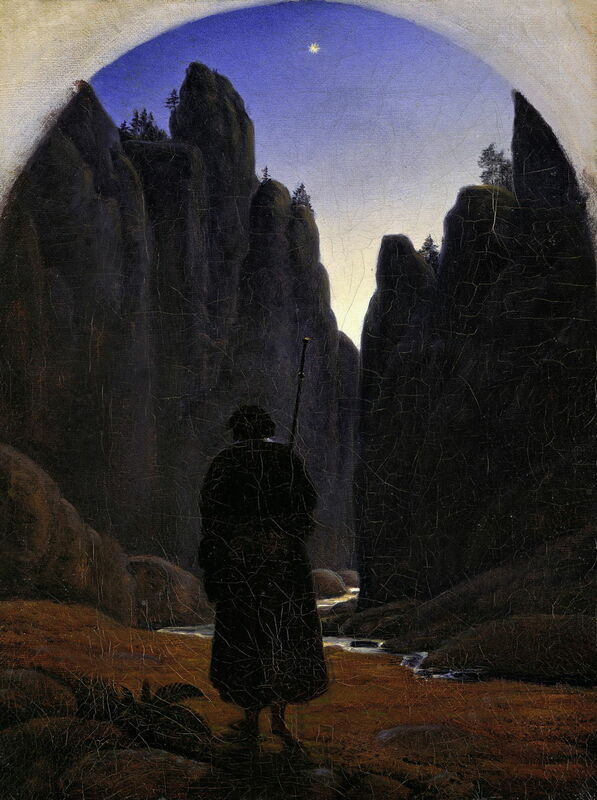 Carl Gustav Carus (1789–1869), Pilgrim in a Rocky Valley (c 1820), oil on canvas, 22 cm x 28 cm, Alte Nationalgalerie, Berlin, Germany. Wikimedia Commons. Like the Norwegian Thomas Fearnley, and Friedrich, many of Carus’ paintings feature his faceless ‘pilgrim’ or traveller. In Pilgrim in a Rocky Valley from about 1820, the man with a hat and walking stick is standing in front of a narrow gorge, which promises to make his passage very difficult. Carl Gustav Carus (1789–1869), Faust in the Mountains (c 1821), oil on canvas, 48 x 38 cm, Staatliche Kunstsammlungen Dresden, Dresden, Germany. Wikimedia Commons. Carus seldom painted identifiable figures in his landscapes. 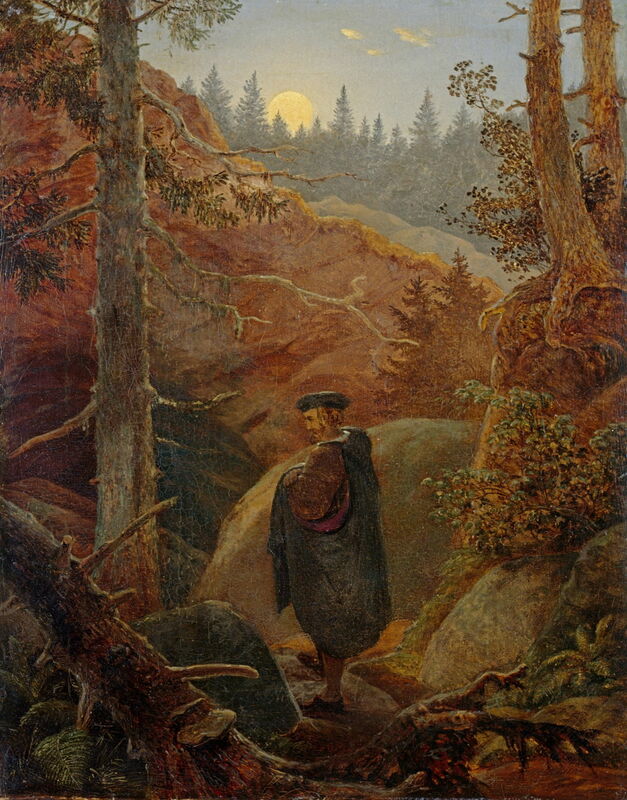 Faust in the Mountains from about 1821 is one exception, and possibly a tribute to his friend Goethe. However, the artist doesn’t include allusions to Goethe’s story in the form of Mephistopheles or a Brocken spectre. The first part of Goethe’s Faust had been published in 1808, and Goethe was working on the second, which wasn’t published until after his death. 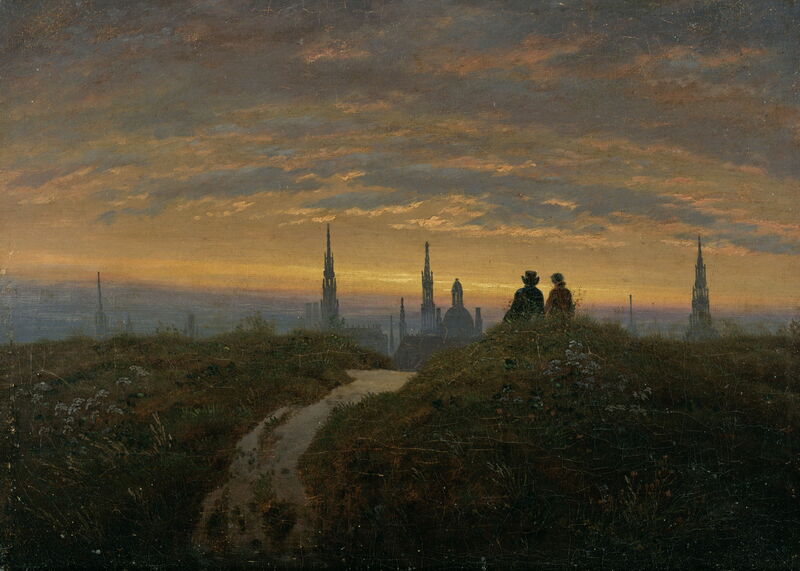 View of Dresden at Sunset from about 1822 is one of Carus’ finest paintings, with the famous spires and towers of the city of Dresden seen against the rich, warm light of dusk. Sat admiring the sight are two faceless figures, one wearing a distinctive top hat. Carl Gustav Carus (1789–1869), Fantasy of the Alps. Eagles Nesting on an Alpine Peak (1822), oil on canvas, 50.8 x 66.4 cm, Nationalmuseum, Stockholm, Sweden. Wikimedia Commons. In Fantasy of the Alps. 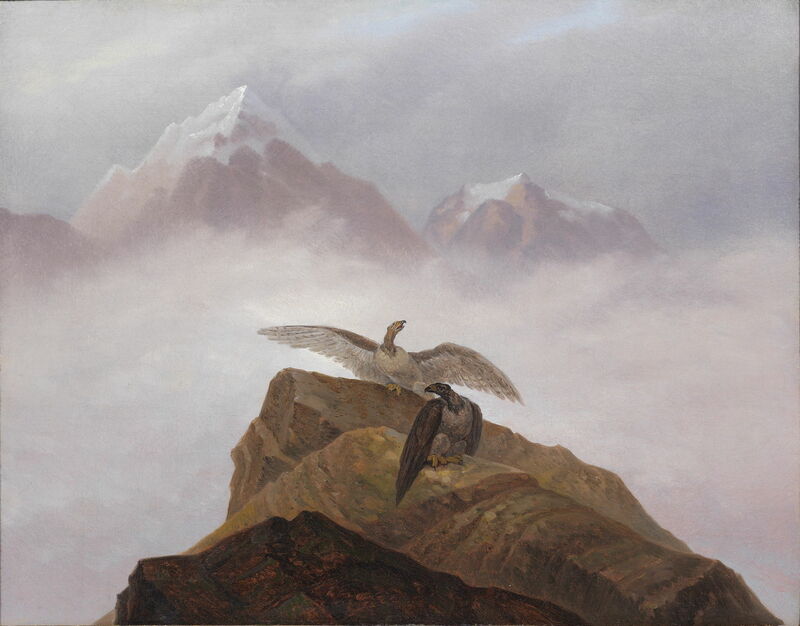 Eagles Nesting on an Alpine Peak (1822), Carus has developed his own distinctive version of the Gothic mountain and fog scene, in which the sole creatures are not human, but birds. 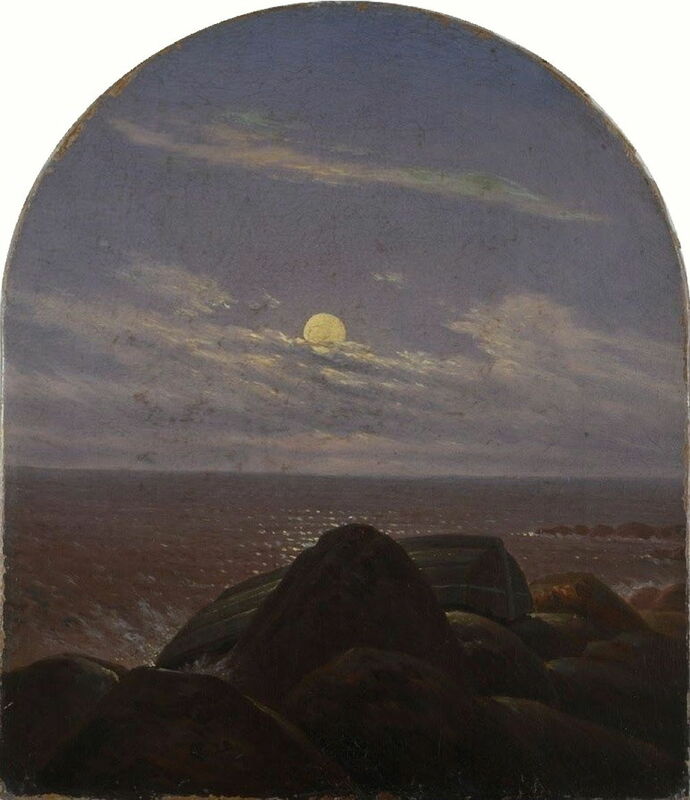 Carl Gustav Carus (1789–1869), Seashore in Moonlight (1823), oil on canvas, 25 cm x 21 cm, Landesmuseum für Kunst und Kulturgeschichte, Oldenburg, Germany. Wikimedia Commons. Carus’ Seashore in Moonlight (1823) may have been based on a view from Rügen, as the full moon would be to the south, an arrangement which is most probable when looking south across the Baltic. Carl Gustav Carus (1789–1869), Woman on the Balcony (1824), oil on canvas, 42 x 32 cm, Galerie Neue Meister, Staatliche Kunstsammlungen Dresden, Dresden, Germany. Wikimedia Commons. Woman on the Balcony (1824) replaces Carus’ faceless male pilgrim with a young woman dressed in black, facing away from the viewer. 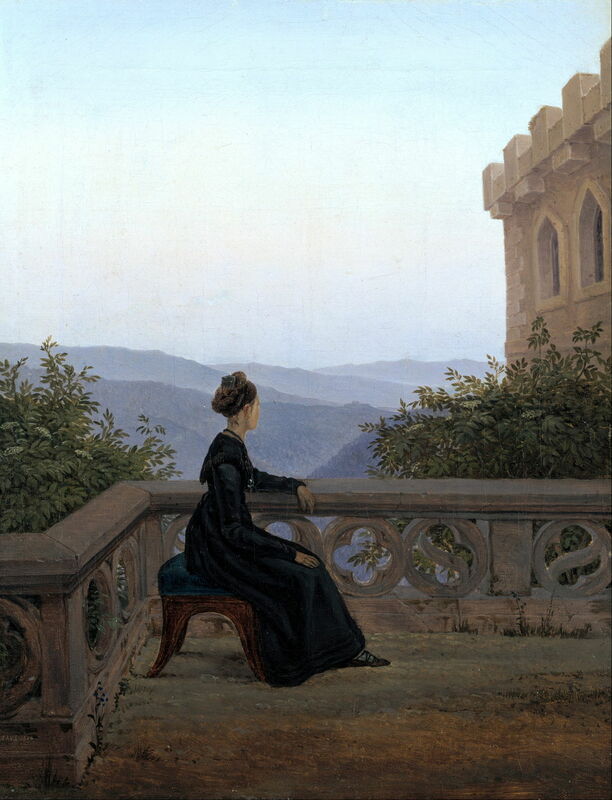 She is here on the terrace of a castellated mansion high above rolling wooded countryside, probably somewhere in central Germany. Carl Gustav Carus (1789–1869), Saxon Countryside. 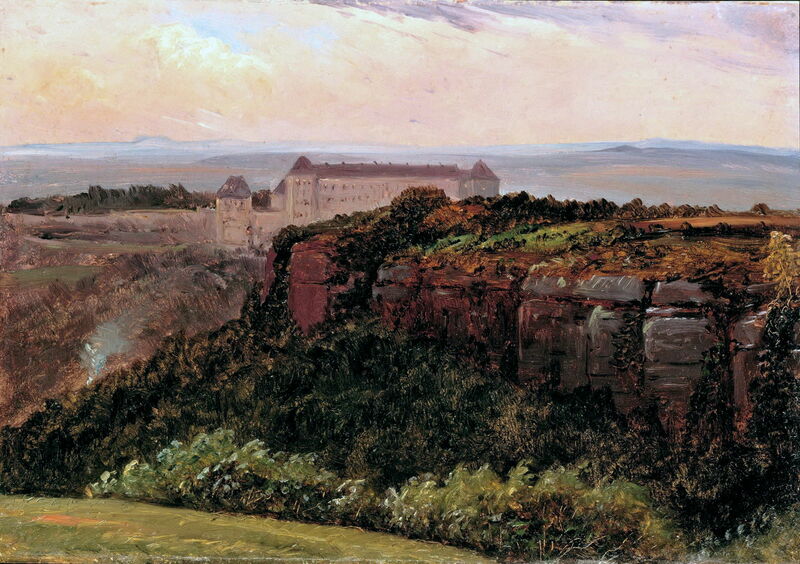 Sonnenstein near Pirna (Saxon Castle) (c 1824), oil on paper mounted on cardboard, 15 x 21 cm, Alte Nationalgalerie, Berlin, Germany. Wikimedia Commons. Carus appears to have been an enthusiastic plein air painter for his whole career. His Saxon Countryside. Sonnenstein near Pirna (Saxon Castle) from about 1824 was sketched in oil on paper, and shows this massive castle which was built high above the River Elbe near Pirna, not far from Dresden, from about 1460. There had previously been a mediaeval castle on its site, and from 1811 it was used as a mental hospital, pioneering what is now known as occupational therapy in mental illness. From early 1940, the Nazis used part of the castle as a killing centre before turning it into a military hospital in late 1942. Carl Gustav Carus (1789–1869), The Imperial Castle, Eger (1824), oil on canvas, 29 × 26 cm, Nasjonalgalleriet, Oslo, Norway. Wikimedia Commons. The Imperial Castle, Eger (1824) had also been the site of a castle for a very long time. This is in Eger, a city in the north-east of Hungary. Its walls and towers have been attacked by Mongols and Turks, and in 1701 it was partially demolished by Austrians. 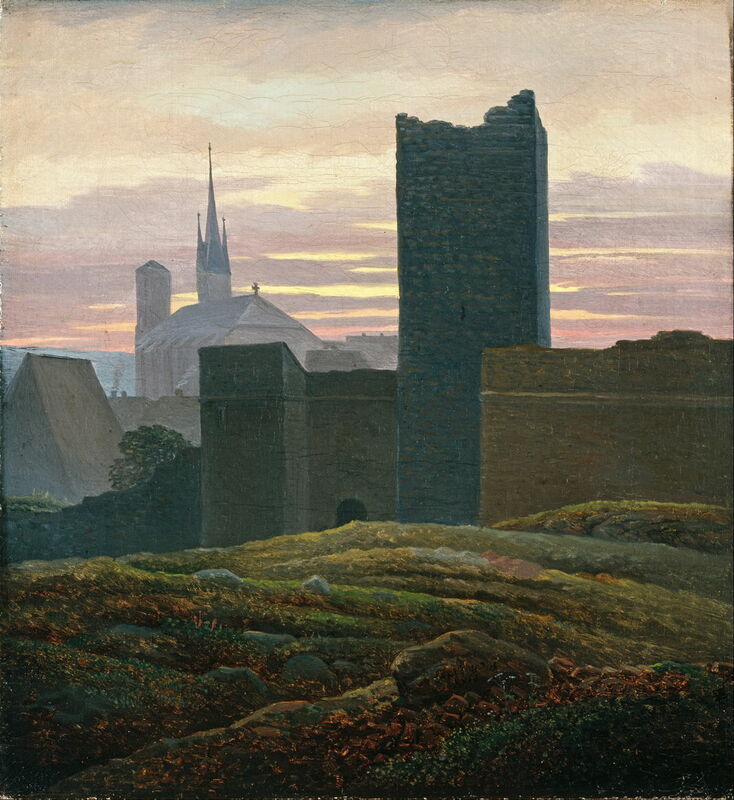 Carl Gustav Carus (1789–1869), Rudelsburg Castle (1825), oil on canvas, 52 x 67 cm, Kunsthalle Bremen, Bremen, Germany. Image by jean louis mazieres, via Wikimedia Commons. Rudelsburg Castle, which Carus painted in 1825, is another Romantic/Gothic location on the River Saale, in Saxony, central Germany. In the 19th century, its ruins became a popular focal point for walkers, and grapevines were planted in its grounds. Carus’ faceless pilgrim or wanderer has made his way here too, this time in the company of his dog. Posted in General, Life, Painting and tagged Carus, Fearnley, Friedrich, Goethe, landscape, painting. Bookmark the permalink.